The quality of each drop of sherry we produce means everything to us. That’s why we’ve spent years finding the best vineyards and bodegas that Spain’s Jerez region has to offer. With its very own microclimate, due to the fresh and humid winds from the west and warm and dry from the east, albariza soil and 300 days of sunshine a year, Jerez is the global centre of sherry production for more than a few good reasons. The quality of our sherries isn’t just down to location though – Manuel Jose Valcarcel, Harveys Master Blender for over 20 years, makes sure that our unique liquid is always up to the highest standards. Harveys vineyards are situated in the picturesque region of Jerez in southern Spain where the local winegrowers cultivate a selection of grapes. Southern Spain is the home of the golden triangle. The three points of the golden triangle of sherry production are the cities of Jerez, Sanlucar de Barrameda to the west and El Puerto de Santa Maria to the south. Each area has its own microclimate that contributes to the character and style of its local sherry. For example, Sanlucar, which is close to the cool Atlantic Ocean and high humidity of the Guadalquivir River, produces a special fino (Manzanilla) that has the fresh and salty tang of the sea. Launched in 1882, and granted the Royal Warrant shortly after, Bristol Cream is crafted from a delicate blend of Jerez’s finest wines; delicate finos, aged amontillados, fragrant olorosos and the special Pedro Ximenez grape providing a silky, mellow smoothness. Known for its deep golden chestnutty and amber tones, the nose is full, fragrant, pungent and elegant all at once. 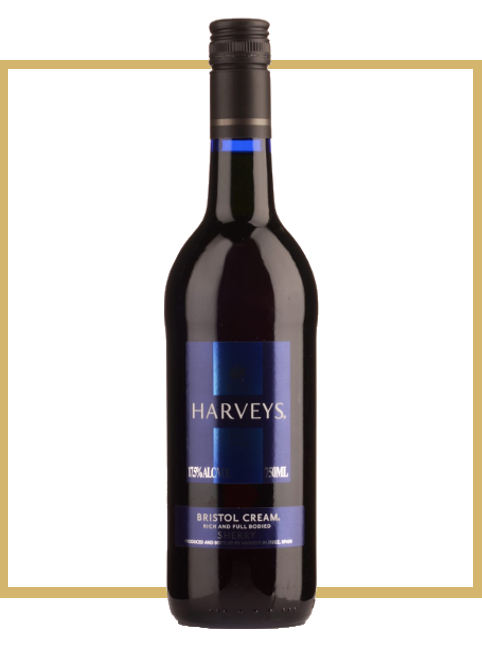 On the palate Bristol Cream delivers a full bodied experience with rich yet mellow notes leaving a long lasting and velvety finish. A complete, balanced and surprising compendium of wine from Jerez, it’s best enjoyed chilled at 12°C in a wine glass or mix over ice with a slice of orange.